The Fox network is wishing you – the home television viewer – a very Carrie Christmas. And they’re gift-wrapping two hours of entertainment in a special package titled Carrie Underwood: An All-Star Holiday Special that will air December 7 (8-10 p.m. ET/PT). Of course, Fox, the network that brings you American Idol, has the gift that keeps on giving with Underwood. The country vixen from Checotah, Oklahoma, who broke through to national fame by winning the fourth season of A.I., has reason to be in the holiday spirit. 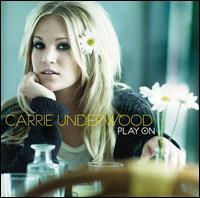 Her third album, Play On, was released November 3 (19 Recordings/Arista Nashville) and debuted at No. 1 on the Billboard 200, and she’s making all the talk show rounds this week, from Conan O’Brien on Monday to Ellen Degeneres (Wednesday) and Jimmy Kimmel (Thursday). Last week, she completed her second straight stint co-hosting the Country Music Association Awards show with Brad Paisley, performing “Cowboy Casanova” in hot pants, one of her 10 costume changes, cracking jokes, and taking a not-so-subtle shot at Taylor Swift nemesis Kanye West (“Brad’s idea,” Underwood said on The Tonight Show). If only those Grinches disguised as tabloid gossips weren’t around to spill the eggnog. Underwood, during a Monday conference call to promote her special, took time to set the record straight when asked about the ending of the very entertaining CMAs last week. Underwood, 26, only received two CMA nominations this year, but had the chance to win Female Vocalist of the Year for the fourth consecutive time. The streak ended as the 19-year-old Swift won en route to sweeping all four categories in which she was nominated, including Entertainer of the Year. She became the first woman since Shania Twain in 1999 to capture the CMA’s most prestigious honor. Swift’s all-male competition included Underwood’s co-host, along with Kenny Chesney, George Strait and Keith Urban. It’s hard to believe someone would mistake Underwood for a sore loser after watching that. Yet she witnessed a similarly misguided stance at the CMAs three years ago, when Faith Hill was taken to task for expressing mock anger after losing to Underwood in the female vocalist category. This time around, it was Underwood who had to defend herself. Earlier in the call, Underwood was asked about her relationship with Paisley, who performs on his own and with his CMA co-host for the upcoming special, although he couldn’t be in Los Angeles for the taping. “Brad and I have a bit of a history together; I got to co-headline a tour with him not too long ago; he’s just a great guy. … The more we’re around each other, the more we get comfortable with each other. Things just get better and better. … It was a lot of fun co-hosting the CMAs again. I felt like we did a good job. I was really proud of both of us for managing to, I don’t know, not cause any major problems (laughing, perhaps not knowing what was yet to come). It was just a lot of fun. Underwood said two of her favorite moments on the special were with Parton and Cook. Among other recent American Idol performers, Underwood said she enjoys Season 8 winner Kris Allen, who’s from Conway, Arkansas (“He seemed really genuine and he was kinda from my neck of the woods”), and Danny Gokey (“just the sweetest person”). Her Idol worship notwithstanding, Underwood offers firm words of advice to those alums still trying to make it in the music business. “Any contestant that comes off Idol that does well on Idol has to make sure they know what people voted for,” said the blond singer who is the best-selling American Idol winner with more than 10 million albums purchased. “I’ve seen it happen a few times where people are one thing on the show and then they get off the show and try to do something else. And it’s really strange because Idol is one of those things that … they’re telling you what they want. People are telling you, ‘We love this person as is.’ And it’s the best testing forum that you can possibly have. • Photos from Carrie Underwood: An All-Star Holiday Special by Michael Becker/Fox. • CMA Awards photos by Rick Diamond/Getty Images. Great article about Carrie, though still not sure what I think of those hot pants at the CMA, lol. Interesting that she highlights David Cook, Kris Allen and Danny Gokey among her recent Idol favorites. David Cook and Danny Gokey are probably my all-time favorite men on AI, maybe overall–she has good taste. I’m really looking forward to seeing Carrie’s holiday special with David, and perhaps in time a duet with Danny also when the right opportunity presents itself. Thanks for the comments, Lynn. I personally liked the hot pants. Carrie didn’t mention it, but it seems like she would eventually work with Danny. She also has plans to record a full-length Christmas album.